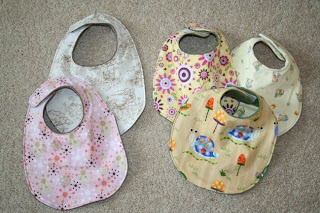 Lately I've been a bit of a sewing maniac - probably due to the "nesting" phase kicking in. In an effort to keep things somewhat under control I've put a self-imposed restriction on buying more fabric (my prize winnings from The Fabric Fairy don't count though - hehe). I've been sewing for just shy of a year now, yet my fabric stash is getting ridiculous. As you other sewing addicts can attest, whenever you actually need to buy a sewing item, it's almost impossible not to walk away with a yard or two of new fabric at the same time with no particular project in mind. Another sign of the addiction is hording leftover scraps. It seems too wasteful to toss all those oddball pieces of lovely fabrics. So my new goal is to use what I have on hand. Behold, the results! Part One - Outfit: This little two piece set was made from leftovers from making my Etsy merchandise. There wasn't enough of either organic fabric to make a single item, but thanks to the fabulous design of these separates (Nuppu & Nuunuu from Ottobre Design) the weird shaped scraps I had were just enough to pool together. 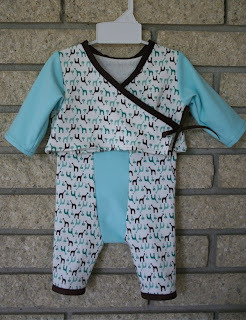 Add in some remnant chocolate brown bias tape for a little contrast trim and an entire outfit has been born! - Must be waterproof - Both my other kids were super sloppy drinkers so milk always soaked through the usual fabric bibs to their clothes, which defeats the purpose of a bib. - Must be vinyl & phthalate free - I found the ones with the waterproof lining so handy, but a lot don't specify what that lining is actually made of. 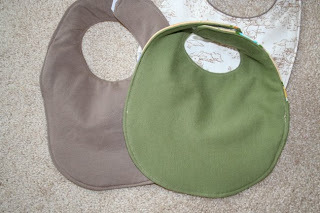 - Must have velcro close - The tie ones look cute, but are not realistic for putting on a newborn at 2am in the dark. - Must not show stains - Why are so many bibs white or light colored, so they show the bogus looking stains like nobody's business? ?